Radiographs are one of the most common and useful diagnostic tools in medicine because of their ability to penetrate tissue to display organ outlines and bones. 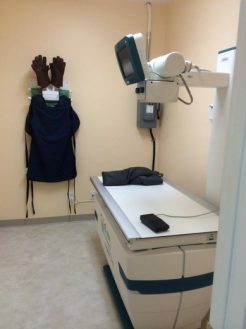 At Wind River Veterinary Service, we use the latest digital radiology equipment to examine your pet’s bones, lungs, heart, abdomen, oral cavity, and other areas for diagnosing and monitoring many medical and surgical conditions. If we suspect your pet has a fractured bone, swallowed a foreign object, or is suffering from a heart problem, a radiograph can tell us what we need to know. They are immediately able to be viewed on a computer monitor. They take less time to process. No harsh chemicals are needed to develop the images. Digital images can be sent by e-mail to a specialist. Wind River Veterinary Service’s investment in digital x-ray technology reflects our commitment to offer you and your pet the best and most comprehensive healthcare available.